I use the term loosely – miracle. There’s really nothing supernatural about my cuckoo clock, but I KNOW that God keeps it running. We inherited the cuckoo clock from my husband’s great-uncle back in the early nineties. (Is that really over twenty years ago? Inconceivable!!) It had hung on his wall for years, hanging there silently for part of that time. When we broke up the house, we were glad to take the clock. I remember bringing it home and calling the local clock shop for prices on getting it cleaned and oiled. We had just taken our first pastorate, and the price was out of the question. So…I took off the back, blew out the dust, and sprayed it with WD-40 (which I’ve since learned is a NO NO!). It started running like a charm. Over the years, it would stop running and it seemed like we never had the money to fix it, so Mrs. Fix-it would once again remove the back cover and try to get it going. One main ingredient always took priority into the mix: prayer. I can’t tell you how many times it would stop, and I would pray over my clock, always praising God for getting it to run again. Recently, it seemed to have some real issues: instead of “cuckoo,” it sounded more like “cuck.” One of the bellows had ripped, so I taped it. As I was handling it, something happened and I broke off the hour-hand and the bell of the hunting horn that surrounds the face of the clock! When I picked up the hand, it crumbled into four pieces! As I sat there looking at the mess, I was ready to throw the thing in the trash – it looked impossible…but I fixed it, and once again it’s running like new! Each tick reminding me that God cares for every detail of my life! He even cares about my cuckoo clock! 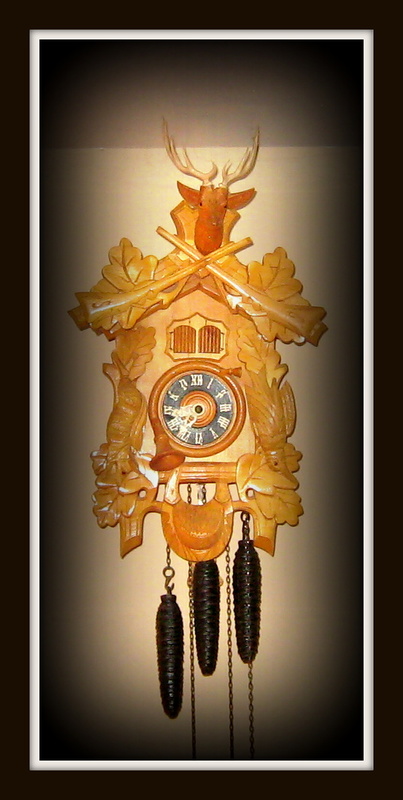 Since my childhood, I’ve loved cuckoo clocks and hearing the steady tick-tock is a great delight; the hour chime keeps my piano lessons on time, and in the night when I’m lying awake, it gently reminds me of the hour. Tick-tock, and another moment in time has passed away. I suppose to some it could be annoying – a constant reminder that time is fleeting, one tick at a time; but for me, it is a soothing sound. It reminds me that my days are in God’s hand. Each moment is important, not to be wasted but to be used for His glory. Even if it is just a quiet moment, meditating on His Word or whispering a prayer of thanksgiving for His goodness, the tick-tock keeps my focus that life is a precious gift from God. Tick-tock, God is still on His throne…tick-tock, all is well…tick-tock, rest in My Everlasting Arms, my dear child.